I got kind of sidetracked this last week with the holidays and all, but I have begun a new (somewhat) large painting. It's a great looking vintage mixer - also made by Hamilton Beach - I picked up on ebay. The dimensions are 18 x 24, which for me is pretty big. It's proving to be a bit of a bear to paint, so I'm not committing it to any particular gallery until it's finished. There's always a chance it will wind up under a new coat of gesso. I've only got three days into it so far, so I'm not going to start freaking out right away. I'll give it a few more days before I decide to finish it, or trash it, and start on something else. My friend Robert Deyber has created something new. I know a lot of artists are video taping their painting sessions, then publishing them to YouTube. Bob has taken this a step further, and installed, what I refer to as the DeyberCam. 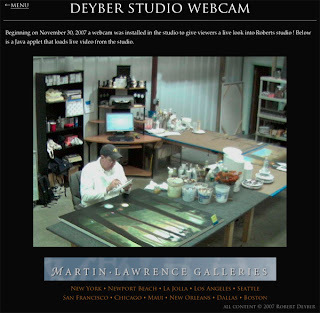 It's a continous live remote view of him at work in his studio. A "fly on the wall" look at the artist in action. It's a little voyeristic, but a good way to kill a few minutes during the day. He's given me permission to post the URL here for anyone interested in having a peak. You can visit by clicking here. The big painting is finally finished. I picked it up this morning from Gallery Street along with the CD containing the jpeg. Apparently the painting garnered a lot of positive attention while it was hanging around their studio. This was nice to hear, since I was afraid that no one would recognize what it was. I couldn't wait to get home, open up the CD and check out the image. They really do a great job, it looked spot on. The first thing I did was to send an email to PlusOne, with the image attached. I'm still waiting for a definitive answer as to whether I'm in or not. Hopefully this will persuade them to give me a chance. We got a call from Wynne/Falconer last night. 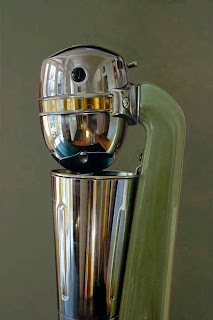 Ken and Ally had just returned from the 11th Annual Boston International Fine Art Show. They sold two paintings during the show, and one of them was Karen's. My two percolators got a lot of attention they said, but no buyers. 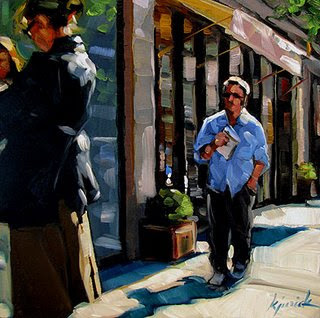 Another cool bit of news was that Joshua Rose, an editor at American Art Collector Magazine gave a slide presentation commenting on work displayed at the show, and one of the images he used was one of Karen's paintings. I've started another "large-ish" painting. It's a gamble, but I had such a good time with this one, I had to do it again. 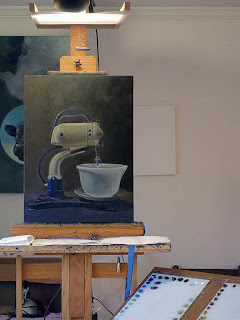 I tell you what, when you spend all your time working on a single painting, it takes a long time to come up with something new to post on your blog. I know that image of the milkshake mixer was getting pretty stale. 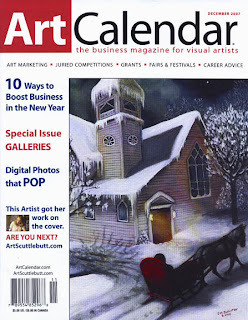 Fortunately the December issue of Art Calendar Magazine has just come out, and there's a short blurb about me on page three, giving me something to post. Kim Hall, the managing editor, contacted me a few weeks ago for a follow-up interview to the October 2006 Issue containing an article about the Painting A Day movement. Why they chose me for the follow-up, I can't say. None the less it's fun to see your name in print. It's especially nice when they also include an image of one of your paintings. If you'd like to read the article you can find it by clicking here. I have finished my "big" painting, and will post the completed image after I get it back from Gallery Street. I'm having this one professionally photographed. They do a great job of photographing artwork, and I really want a high-quality image of this one. I have to say, I think it turned out pretty good, and it has left me with the desire to go large on another one. 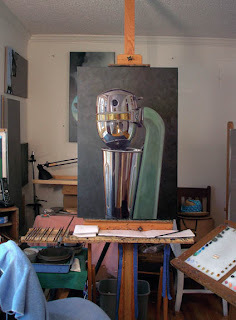 My friend Karin Jurick recently purchased a digital video camera, and has begun to tape her painting sessions. Her first movie showed only her hands as she prepared her palatte. As simple as that sounds it's a fun to watch. The audio of her describing which colors she uses, and why is a joy to listen to. Her second video shows the entire process of painting the picture above. There is no speaking in this one, but the soundtrack is great. You can access this video on You Tube by clicking here, and you can watch the "color palette" video from her blog. It takes a few minutes to load, but it's worth the wait. If you are not aware of Karin's work you should check out her website and blog. My wife Karen has been accepted to the Addison Gallery in Boco Raton, Florida. She's particularly excited about Addison, because they will be selling not only her originals, but her giclees as well. Karen's been selling prints from her website for a few weeks now with a good degree of success, but welcomes the additional print sales from such a prestigious, and well established gallery. It will be interesting to see where this leads. 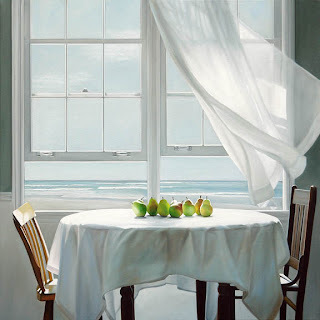 Karen and I both had paintings at the 11th Annual Boston International Fine Art Show this year, and are anxious to hear how our work was received. Kenny and Ally Wynne from Wynne/Falconer Gallery took our work there. Hope something sold. It's taken a week, but I've finally completed the first pass on my "big" painting. Before I go any further I suppose I should identify what it is, so those of you who don't recognize it right away won't wrack your brains trying to figure it out. It's a vintage Hamilton Beach Milkshake Mixer Number 30. This is an unusual crop, but I wanted to concentrate on the mechanical portion of the machine. I love the big chrome head with its' vents, and on/off switch. Plus at this size you get a good view of the room reflected in the motor housing. I have no idea how popular this subject may or may not be, but I have to say I've really enjoyed working on it so far. I recently purchased a bunch of vintage kitchen appliances on ebay to paint, and this is the item I wanted to begin with. It's just so cool looking. This is the first painting I've done in a while where I have allowed myself to work methodically, without pushing to finish quickly. It's a luxury I know, but I want to push the envelope with this piece. PlusOne in London hasn't made an offical decision as yet, but I did receive an email yesterday stating that the paintings had arrived safely, and, "they are lovely". I think that's a good sign. They've also asked about larger paintings. If this one turns out the way I hope it will, I'll offer it to them, and cross my fingers once again.